It’s great when a client has a definite idea about a new space. 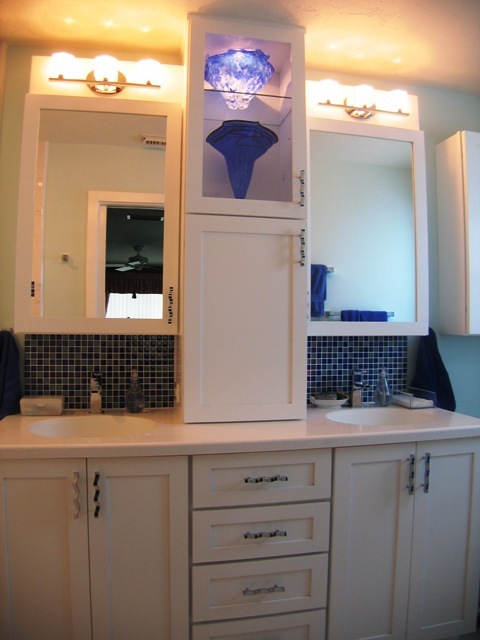 This recent Sarasota client enjoys the color blue and knew she wanted it prominently featured in her new Master Bath remodel. 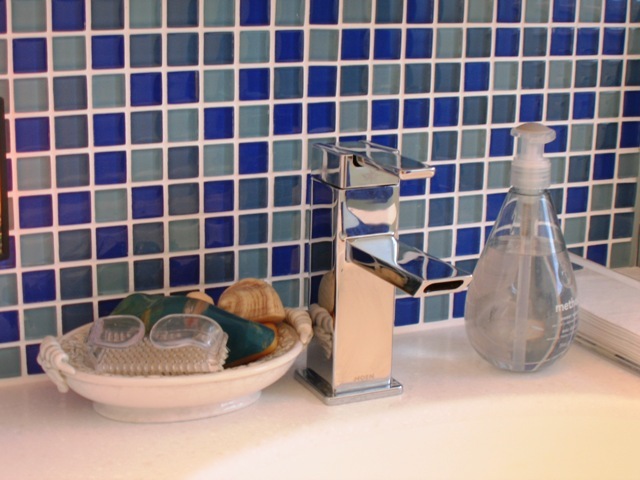 The bathroom she had been living with since purchasing the house 18 years ago had many different shades of blue – too many. From watery blues to navy, the different colors were competing with each other and just looked like a jumble. 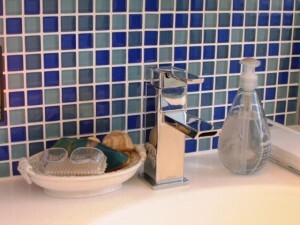 The solution – reduce the amount of blue in her new space. I asked her to show me the shade of blue she enjoyed most. She pulled out a blown glass bowl with a perfect azure tone. It took some convincing on my part, but she finally realized that if she wanted that blue to be the highlight, we had to make it pop off of the wall. That meant everything else had to be neutral. What’s the easiest neutral? White, of course. By positioning a display cabinet facing the entry door and lighting the interior, we were able to make this beautiful piece the central spot of her new master bath. Our Stressless Collection of cabinetry in a crisp Jasmine White paint was paired with Corian Antarctica, a white-on-white surface, for the vanity tops and shower seat create the perfect backdrop for the multi-tone blue glass tiles that highlight both the vanity and the barrier-free shower. 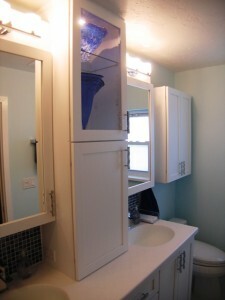 Polished chrome fixtures and a whimsical handle give this once dreary small space some much needed pep. Remodeling Partners: Fred H. Bey, Inc. 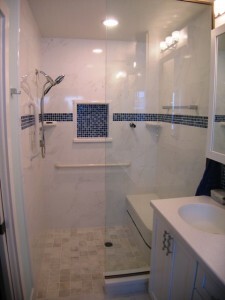 This entry was posted in Design and tagged blue, glass tile, Master Bath, remodeling, Sarasota, shower, white. Bookmark the permalink. Everyone was responsive, considerate, concerned to understand our needs and to meet them as best you could. We had a timeline we needed/wanted to meet – and you did it with only a minor delay which could not be avoided due to a death in [the installer’s] family, Could not have asked for more.